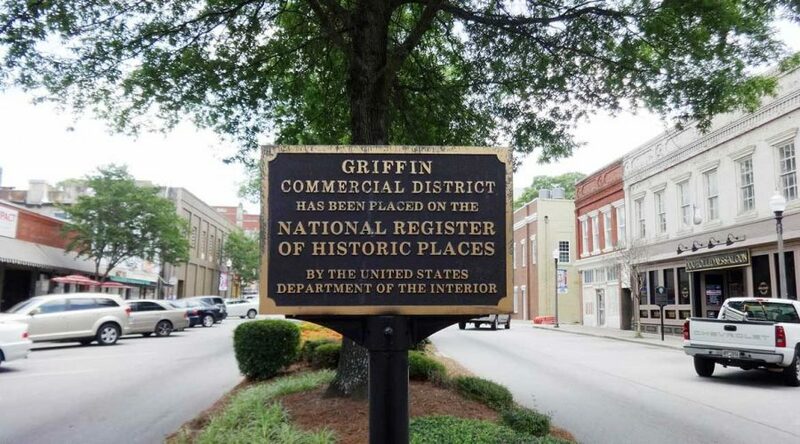 A well-known city in Spalding County and part of the Atlanta Metropolitan area, Griffin has a rich history, having been founded over 150 years ago and named by Colonel Lewis Lawrence Griffin. Griffin is famous for giving us several standout NFL football stars, including Bears wide receiver Willie Gault and defensive stars Chris and Nic Clemons. Located about 35 miles out of Atlanta, Griffin is the birthplace of the legendary Doc Holliday and has been featured in a variety of movies and television shows. Real estate is quite affordable in Griffin, and you will do fine whether you choose to rent or own. Current residents prefer renting about 3 to 2, with 62 percent renting and 38 percent owning their own homes. You can expect a great deal on a home in Griffin, as the median home value is $98,900, a little more than half the national average of $184,700. Renting isn’t quite as much of a bargain, with a median rent of $794 a month that’s still noticeably below the $949 national average. The most popular home styles here are the ranch and the raised-ranch. The median household income is $31,000, somewhat below the national average of $55,322. The cost of living index is 93.5, more affordable than the average (100), largely because housing is so affordable. The unemployment rate is 4.6 percent, somewhat hire than the 3.9 percent national average. Griffin is a quiet suburb that features simple living, an easy commute to the busy urban environment of Atlanta and affordable housing. If you’re looking to put down roots in Georgia with your family, this might be the ideal place. Griffin is a car-dependent city, with the number of people taking public transportation 88 percent lower than the national average. It’s a commuter city, with 53 percent of people fewer than average working from home. Many people living in Griffin drive to Atlanta to work, which can take a little under half an hour. Griffin also has a walk score and bike score of 34 and 32, with few bike lanes. Those wishing to fly out of Griffin will probably want to travel to the Hartsfield-Jackson Atlanta International Airport in Atlanta, although the Griffin-Spalding County Airport may also be an option. Those preferring to travel by rail can go to the Amtrak station in Atlanta at 1688 Peachtree Street. Griffin has 23,643 residents in 8,876 households, with a population density of 1.615 people for each square mile. A third of households have children under 18, while 38.1 percent are married couples. The ratio of adult men to women is 0.8 to 1. Median household income is $30,088. There are a number of college students in Griffin, as it is home to Griffin Technical College and a branch of the University of Georgia. Griffin has a number of parks for residents to enjoy, including the City Park and Pool, where you can rent pavilions with grills and picnic tables for cookouts, parties, family reunions and other fun family activities. City Park features 200 acres of park with a golf course, pool, tennis courts, handicap-accessible playgrounds and ball fields. Families can enjoy the rich history of Griffin by visiting the Griffin Museum which features artifacts dating back to the mid 19th century, including old-time medical and dental equipment from early medical colleges, and 19th century police and fire uniforms. On Lucky Street, fans of the Old West can learn a little of its history at the Doc Holliday museum. There are over 100 restaurants, bars, or coffee shops in Griffin and residents can usually reach at least two within five minutes of their home. Enjoy great American food like country fried steak at great prices at the Corner Café on N. Hill St. or enjoy fresh, tasty seafood at Fishtales Seafood restaurant on 1587 W. McIntosh Rd. For nightlife, options include Doc Holliday’s Saloon at 116 West Solomon Street, where you can enjoy ice-cold beer, friendly staff, stand-up comedy and live music on Saturdays. For a unique experience, check out the Griffin Cemetery Tour, where you can see the rich history of Griffin played out among the graves of the Oak Hill Cemetery. In addition to the Griffin Museum and Doc Holliday Museum, cultural areas of interest in Griffin include the Old Medical College Historical Area, where you’ll find the Griffin Medical Building, one of four pre-Civil War college buildings in Griffin. You can also check out the Hawkes Library, also known as the Hawkes Free Children’s Library, a simple colonial building that has stood for over 100 years. Civil War aficionados will want to visit Confederate Camp Milner at the Municipal Park in Griffin, where most of the Georgia troops for the Confederate Army were mobilized. Named for prominent citizen Ben Milner, the camp was also a national guard training camp during the Spanish-American war. Another spot of historical significance with respect to the Civil War is Griffin’s Stonewall Confederate Cemetery, which is the final resting place of hundreds of Confederate soldiers and one Union soldier. 13.8 percent of the population in Griffin is 65 or older. Older residents may want to look into the Sun City Peachtree community, about a mile from downtown, which features resort-style amenities for 3,400 homes across 1,726 acres. Those amenities include a 35,000 square foot recreational center, indoor and outdoor pools, a fitness center, walking trails and a Lifestyle Director. Residents can also take advantage of the 18-hole professionally designed golf course, continuing education courses, social activities and outdoor sports. Interested in Atlanta? Sign up for home trends updates sent directly to your inbox!